← RP: Worst. Flight attendant. Ever. Coloring done in Flash this time. I'm slowly getting the hang of it, I think. It's less flexible than doing it in Photoshop, but much much faster. 5 Responses to SOD.081 – Bulletman! Wow! Bulletman actually looks cool! Yeah, a small tweaking of the costume goes a long way to improving it. Bah! 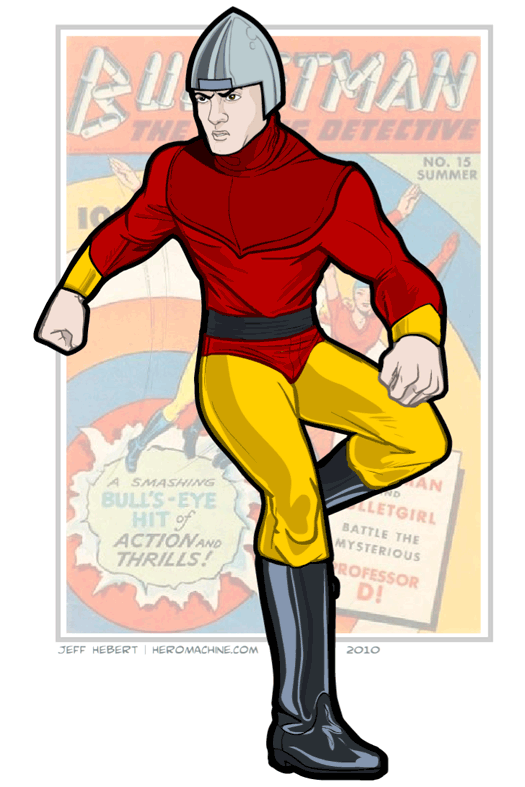 You shoulda done the Bulletman from the toy ads– the one with the hot pants! I’ve always wondered what would Bulletman looks like in the modern comics. Now I know. That pic of Bulletman is really awesome!